Manufacturer of a wide range of products which include anti bird net. From past many years, we are engrossed in providing excellent quality Anti Bird Net. 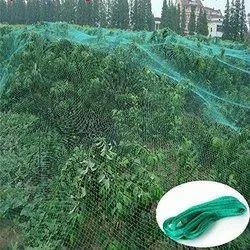 Widely used for agriculture farms, greenhouse, and horticulture areas, these nets come with the advantage like strong tensile resistance and anti UV finish among others. Providing for superior protection from strong sun rays, these nets are suitable to be used in areas like shade houses, nurseries, greenhouses and others.